The Florida Everglades—vast, exotic, and magnificent—come to life in a new medium that overflows with dynamic style. A subtle shimmering of light cascades through blushing coral hues and tranquil florals, adding artful depth and dimension to this retro-modern suite. 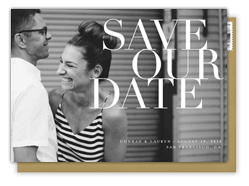 Both natural and elegant, this exclusive save the date design will set the stage with a bold, beautiful statement for any event.